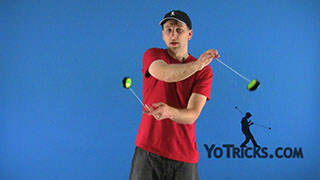 Learn how to do the 2A version of the Schway Yoyo Trick. 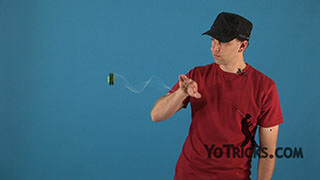 Two-Handed Schway Yoyo TrickThis is Two-Handed Schway, and it looks like this. 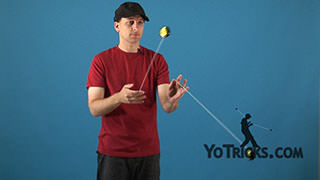 The idea with this trick is that you will essentially be doing a Butterfly, but the yoyos will be going the opposite direction, then your hands will be doing a weaving motion like this. 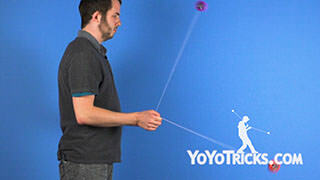 It is a really tough trick, so we will have to practice this in steps here. 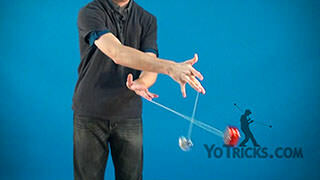 The setup for the trick is going to be this. 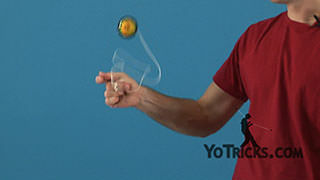 You are going to turn to the weak side of your body, you are going to perform a reverse Around the World with your dominant hand and with your weak hand you are going to throw a regular Around the World and throw them together like this. 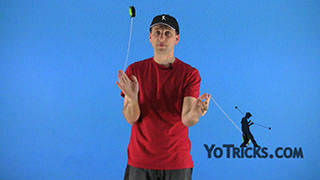 That will be the beginning of the trick. Once you have that part down the next part will be to practice the weaving motion. 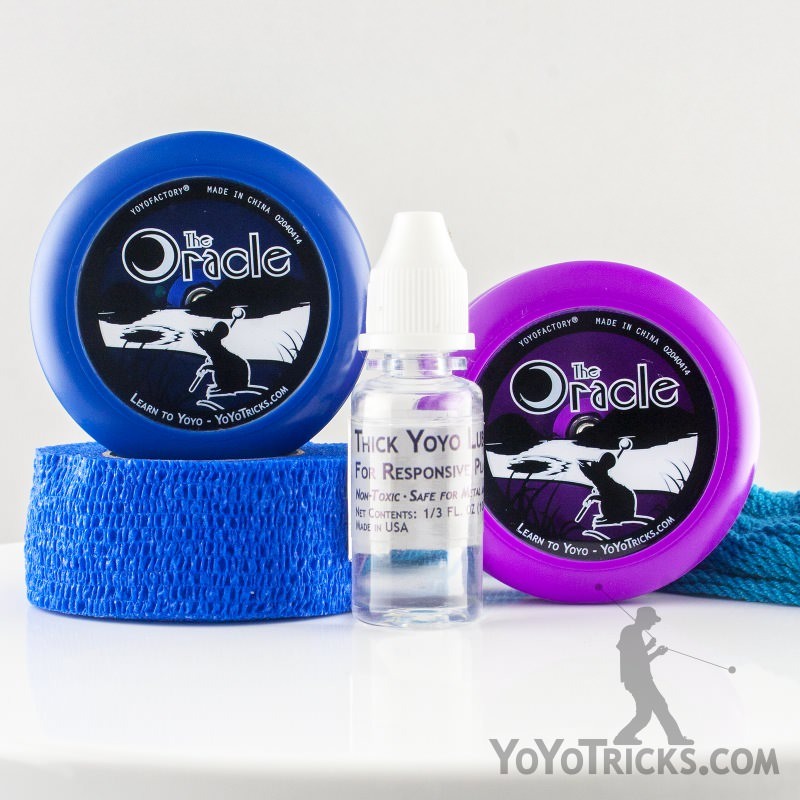 So actually make your yoyos dead, and then shorten the strings up so you have more control over them. 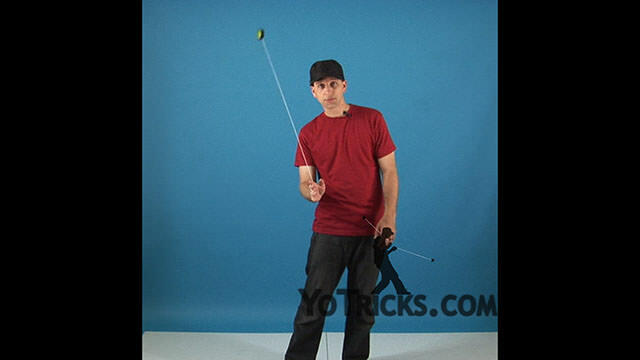 The idea of this trick is that you are going to start in the regular position like this. You are going to do the Around the Worlds no in this direction, but you are actually going to do them opposite. It is really tough to get used to, so just get used to doing the Around the Worlds like this. 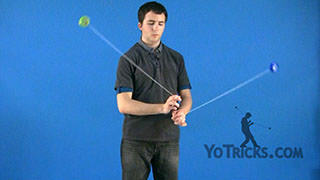 After you get use to that we will practice the weaving motion here. The idea is, just do it one Around the World at a time. 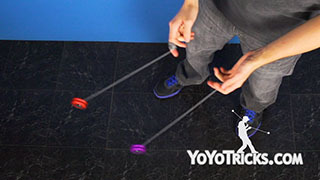 Do the first step here, which is this. 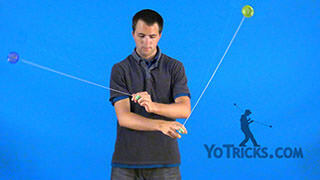 It is going to be, bring your dominant hand over your non-dominant hand, and cross your arms. Once you stop the Around the World, it is going to look like this. 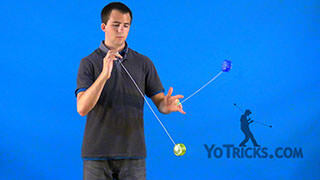 The Dominant hand is over top and also more outside of my body than this one is. 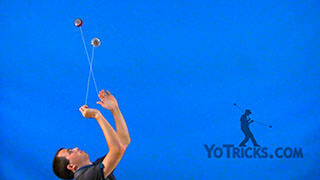 Normally people want to do it in this direction, where the one that is on top is closer to your body, but you have to fight that feeling, and make sure you are always in this position. 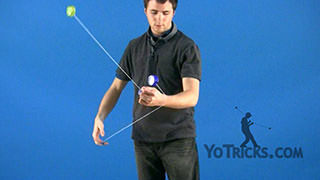 Once you do that, start in this position and do the second Around the World. 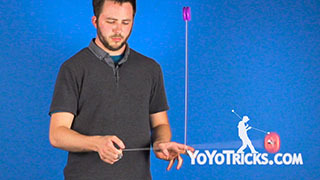 It is going to be, swing it over and then your non-dominant hand is going to be on top and then end up in front. 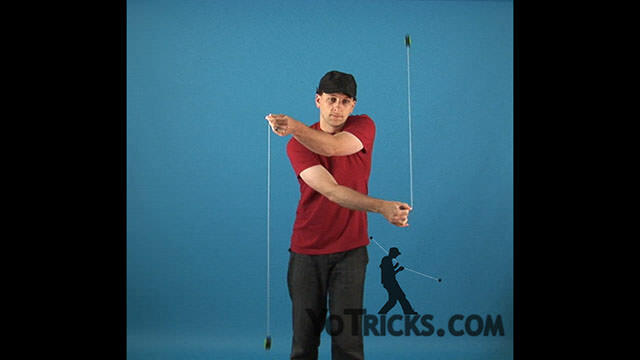 It is just uncrossing your arms and then doing the same thing, but now your non-dominant hand is going to be doing the same work that your dominant hand just did earlier. Once you have that it is just going to be keep on repeating this motion until you get it down smooth. 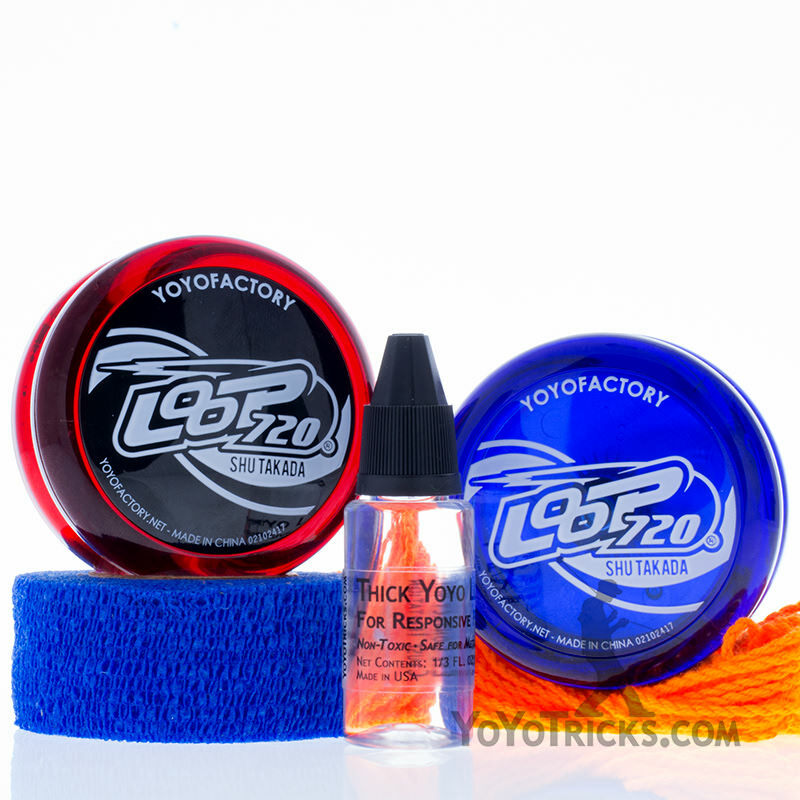 Once you get that down just start working on the weaving part. 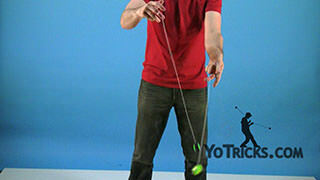 As you feel more and more confident, lengthen up your strings. 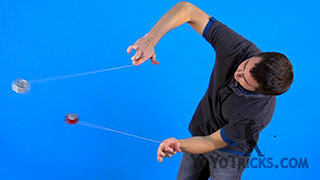 Then, if you feel really confident, then try to wind up the yoyos, give it a throw, and see how well you do. 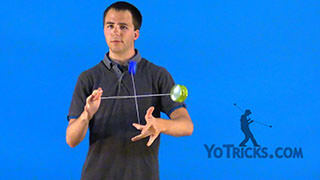 Once you have all that put together, that is the Two-Handed Schway Yoyo Trick.